Explorer Adventure offers Everest Three Pass Trekking, an adventurous journey within high scenic Khumbu within the shade of might peaks of Mt. Everest and other giant peaks, truly a great walk traversing over Everest Three Pass with breath-taking panorama on each high pass. 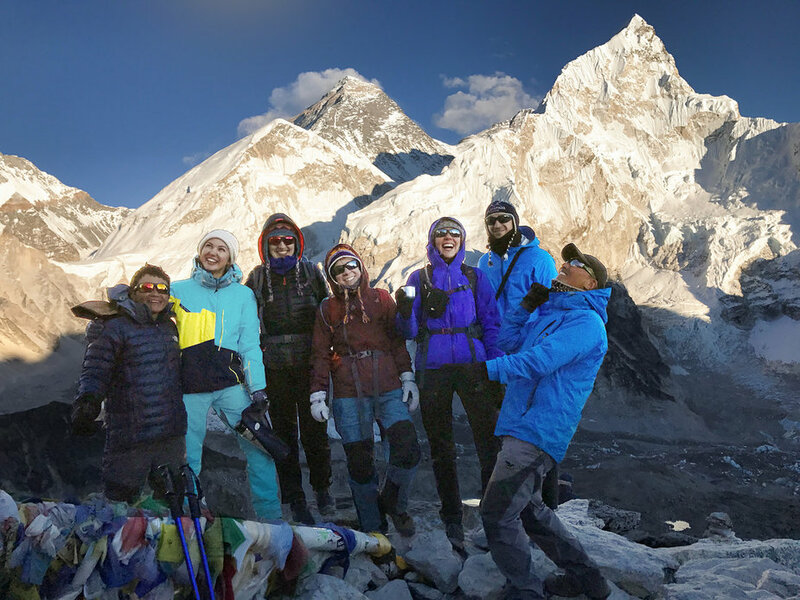 Everest Three Pass Trekking, where trekkers have to face high altitude of more above 5,400 m high on this adventure where each members should be in sound health with good physical fitness and experience in Himalaya before joining in this fabulous adventure around Everest region. Starting with short panoramic flight from Kathmandu to reach at unique airstrip of Lukla town where all various Everest treks and adventure commence and completes in this Sherpa town the gateway to our Everest Three Pass Trekking. As walk continues past nice traditional farm villages of Ghat-Phakding and Monjo where you can witness Sherpa culture and custom of Buddhist religion and then entering Sagarmatha National Park which is listed in World Heritage Sites since 1991, a park protecting its fragile nature and environment as well age-old culture of Khumbu areas, our route leads into lovely forested areas and then climbing high to Namche Bazaar. 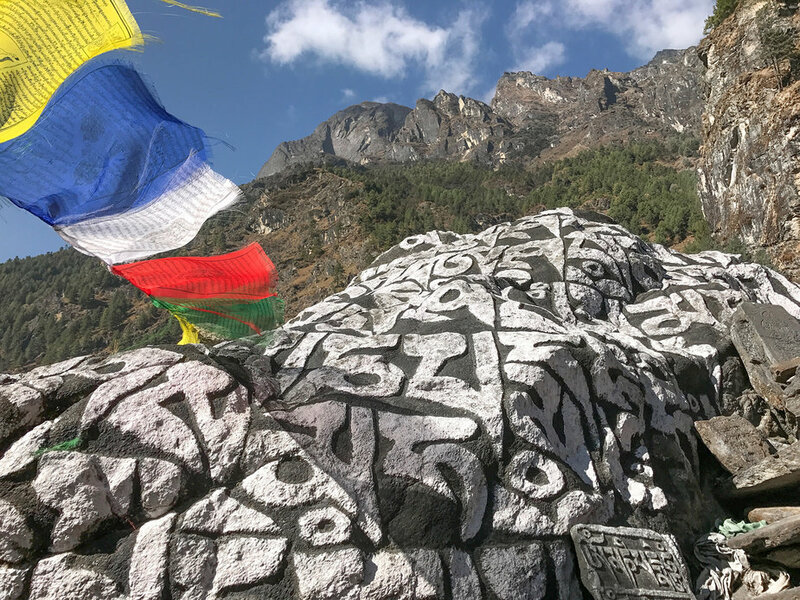 At Namche with time for acclimatization and short scenic hike to its view points and then our route leads towards remote end of Khumbu area at Thame a quaint and sleepy village with old monastery of great interest to visit. From Thame heading towards our first pass of the adventure over Renjo-la to reach beautiful Gokyo valley and its simmering glacial lake situated in the shade of world sixth highest Mt. 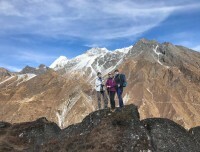 Cho-Oyu with pleasant time at Gokyo heading towards our second pass over Tsho / Cho-La to reach at Everest Base Camp. With wonderful time at base camp with views of massive Khumbu Ice Fall and glaciers and then climb to the highest top of the adventure at Kalapatthar with altitude above 5,545 m facing sweeping panorama of peaks with Everest at its closest. 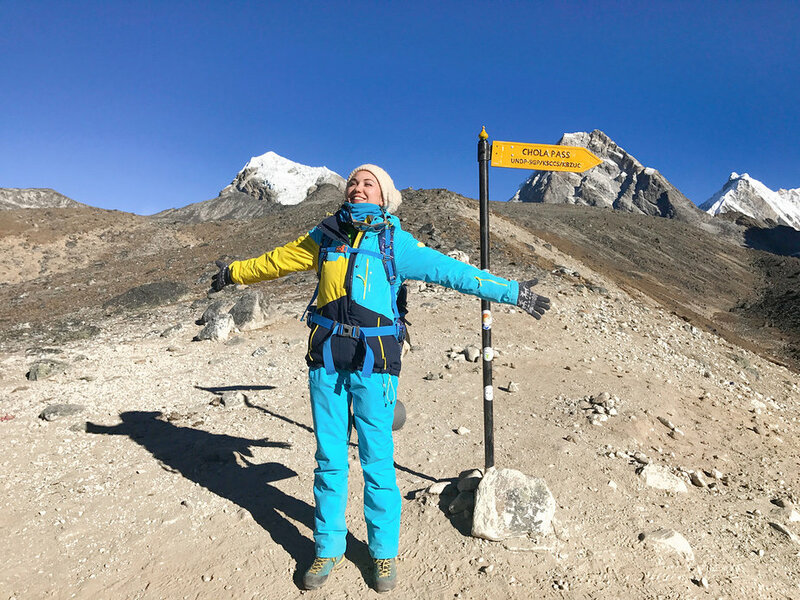 Adventure continues towards our last and final as well the highest pass of the three passes over Kongma-la at 5,535 m high where walking with slow climb over Khumbu glacier and on moraine to reach the top and then descend towards a beautiful valley of Imjatse at Dingboche. Finally our marvelous walks completes in Lukla for scenic flight back to Kathmandu with outmost adventure and memories on Everest Three Pass Trekking. 6 Day 6: Trek to Thame 3,880m - 04 hours.A moderate with short day walks to Thame, as our route heads east of Namche through forest following Bhote Koshi River to reach at Thamu village, and then reaching a small suspension bridge, with nice Bhuddhist Rock Wall Paintings, after crossing the bridge, trek for less than half hour to reach at Thame. Thame famous for where Tenzing Norgay grew up in his teens (first person to climb Mt. Everest) and Apa Sherpa home, a record holder climbing 20th times on top Mt. Everest. 7 Day 7: Trek to Marlung 4,137 m - 04 hours.Another short day of few hours to Marlung following Bhote Koshi River, past village of Thyangmoche and Hungmo, and then trekking past few remote smaller yak herders shades within sparse vegetation on route arid and barren zone. The trail leads past Taranga, through the yak field to reach Marlung village for overnight stop. 8 Day 8: Trek to Lungdeng 4,600 m - 05 hours.Morning walk leads to Lungden passing through authentic Himalayan Villages that blends with surrounding landscape; as route leads on old Trans Himalayan Trade route of Nepal and Tibet located beyond north with Nangpa-La pass to reach at Tibet frontier. Walk continues for few more hours to reach the small village of Lungdeng for overnight stop in a quiet and serene environment with views of Kongde series of peaks. 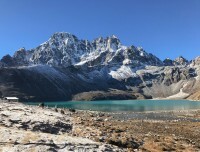 9 Day 9: Cross Renjo- La 5, 465m and descend to Gokyo Lake 4,800 m - 08 hrs.Leaving Lungden, following the trail leading to frozen ponds beneath Renjo La pass, offering fantastic views of Mt. 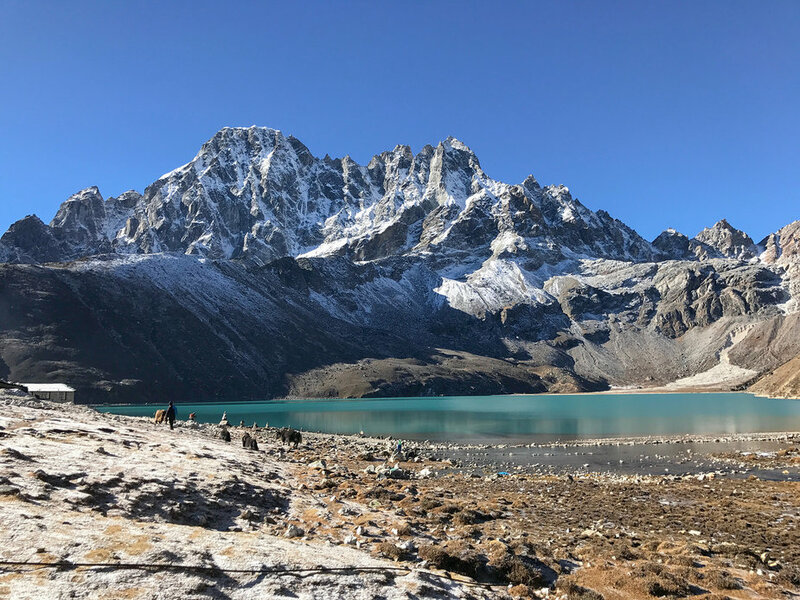 Everest, Lhotse, Cho-Oyu with Cholatse and Taboche, and then cross Renjo La pass, the most difficult section of this trekking to reach at Gokyo valley and it’s serene glacial lake areas for overnight stop. 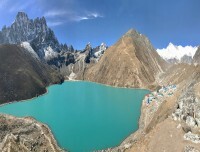 10 Day 10: Hike to Gokyo Ri 5,330 m and trek to Thagnag 4,750 m - 04 hrs.Options for morning hike to Gokyo Ri offers super views of worlds four highest peaks with Mt. Everest, Mt. Lhotse, Mt. Makalu, Mt. Cho-Oyu at one single glance with series of peaks includes beautiful Gokyo Lake and Khumbu’s longest Ngzumba glacier which starts from the base of Mt. Cho Oyu that straddles the border with Tibet. After a great moment descend to Gokyo and continue walk to Thagnag along glacier and moraines, to reach a small settlement at Thagnag for overnight stop. 11 Day 11: Cross Tsho / Cho-la Pass 5,367 m and descend to Dzongla 4,850 m - 07 hrs.Starting early where walk lead to a climb on steep uphill towards Tsho / Cho-la pass after strenuous ascent of more than 3 hours, reaching on top our second pass of the adventure overlooking tremendous views of peaks and glaciers then downhill to a small hidden valley at Dzong-la for overnight stop. 12 Day 12: Day 12 : Trek to Lobuche 4,930 m - 05 hrs.Leaving Dzongla follow the trail that descends to yak herder's pastures. The trail climbs up to the terminal debris of Khumbu Glacier, and continues till it reaches at Lobuche for overnight stop, a small settlement and in the comfort of nice good lodges. 13 Day 13: Trek to Everest Base Camp 5, 364 m via Gorakshep 5,180 m - 06 hrs.Walk today offers great views of Mt. Everest the highest peak on this planet towers high above 8,848 meters / 29,028 ft, on reaching at Gorakshep following a moraine and icy path to Gorakshep with few nice lodges. This is the last place with lodge before Everest Base Camp, after a refreshing break continue walk o Everest Base Camp over moraine to reach at Everest Base Camp beneath massive Khumbu Icefall. After spending some time at base camp, return back to Gorakshep for overnight stop. 14 Day 14: Hike to Kalapatthar 5,545 m /18,192 ft and return to Lobuche.Early morning climb to Kalapatthar for stunning view of Mt. Everest and its surroundings peaks. Kalapatthar a vantage point for views of entire south face of Mt. Everest and other high mountains, after spending some moments here a gentle descend to the small settlement of Lobuche for the overnight stop, with afternoon free for sidewalks and preparation for the next last pass of the adventure. 15 Day 15: Trek and cross over Kongma La 5,535m and walk to Dingboche 4,340m - 08 hrs.Leaving early morning from Lobuche to reach Imjatse valley at Dingboche village; enjoy the remoteness and perfect wilderness of the area with harsh beautiful nature, on route facing grand views of Mehra and Nuptse peaks, then traverse the highest pass of the trip over Kongma La pass at above 5, 535 meters high. After a great moment descend towards Imjatse valley and walk to Dingboche for overnight stop after a hard tough walk and climb of more than eight hours. 16 Day 16: Trek to Kyanjinma 3,640 m via Thyangboche 3,867 m - 06 hrs.Leaving Dingboche and Imjatse valley with grand views of Amadablam, Nuptse wall, Lhotse, Makalu and Island peak then head towards famed Thyangboche Monastery offering grand panorama of Everest and majestic Amadablam with series of peaks, a lovely spot surrounded with lush vegetation and tree lines. Thyangboche Monastery also holds a great event ‘Mani-Rimdu’ a colorful religious festival where monks on mask dances wading evil spirits the festival falls in the month of October as per Buddhist lunar calendar. 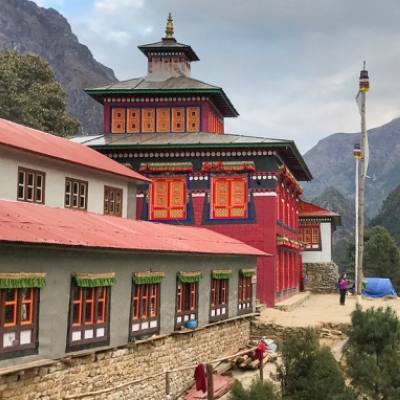 Here with time to visit its interesting monastery then head downhill to cross over Imjatse River where an hour climb leads you on the main trail of Namche but with overnight before Namche at Kyanjinma in serene surrounding with awesome views of peaks. Here chances of spotting some wild-life like musk deer, herd of Himalayan Thar and pheasant Danfe (National bird of Nepal). 17 Day 17: Trek to Monjo 2,860 m via Namche Bazaar - 05 hrs.After a pleasant morning with super views of Everest and adjoining peaks, a nice walk leads you at Namche with time for lunch break and stroll around its bazaar with stores and shops, afternoon walk downhill to Dudh Kosi River to reach at Monjo village for overnight stop before Lukla. 18 Day 18: Trek to Lukla - 04 hrs with afternoon at leisure.Our last walk of the adventure a short trek of few hours following on the same trail back to Lukla past Phakding and Ghat villages crossing few times over Dudh Kosi, with last final climb to reach Lukla town For last overnight stop around high scenic Khumbu and Everest region. 19 Day 19: Fly to Kathmandu and then transfer to your hotels.Morning transfer to Lukla Tenzing and Hillary airport for sweeping short flight to Kathmandu facing scenic views of mountains, green scenery of hills and farm fields with nice villages and towns as flight lands at Kathmandu airport and then back to your hotel, with free afternoon to relax of great memorable adventure on Everest Three Pass Trekking. 20 Day 20: In Kathmandu spare and contingency day with optional tour.A free day in Kathmandu reserved as contingency in case of flight delay and cancellation at Lukla, which can occur sometimes as Himalayan weather pattern can be unpredictable with bad unfavorable day for flights. Just to be in the safe side if all goes perfect as per the itinerary days, one can enjoy the rest day for individual activities and relaxing or join in for another exciting sightseeing tour around Kathmandu-Patan or Bhaktapur. 21 Day 21: Depart for international flight home ward bound or to respective countries.Your last memorable day in Nepal after a wonderful experience on Everest Three Pass trekking with great service of Explorer Adventure, and as per your international flight then transfer to Kathmandu international airport for homeward bound or to your respective destinations. 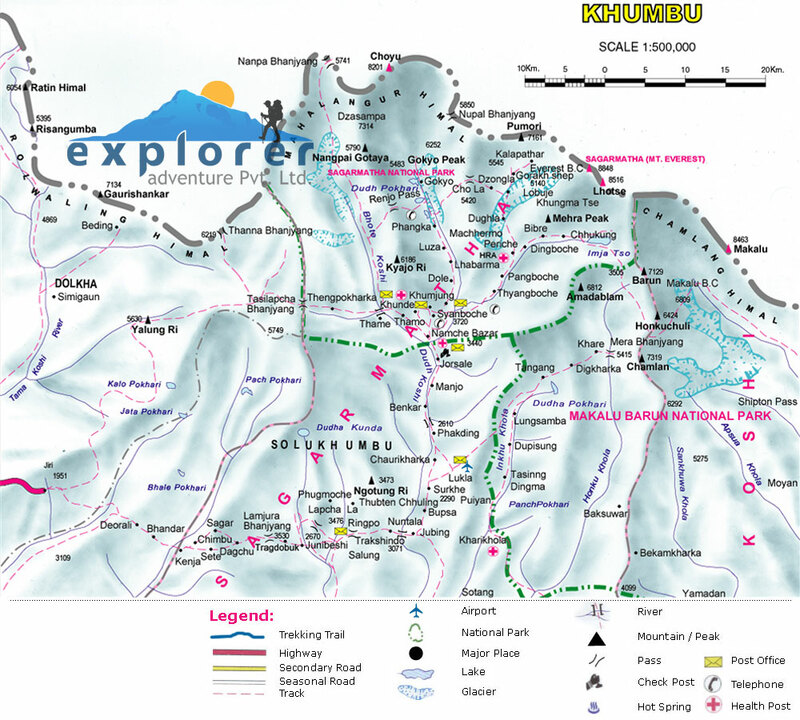 Highest elevation gain: Renjo-la 5,465 m, Tsho-la 5,367 m and Kongma-la 5,535 m and on top Kalapatthar 5,545 m high. Season: April to June and September to early December months, April to May wild flowers in bloom with clear morning might get cloudy late afternoon times, October to December clear day for views but can be very cold in the morning and night time above 3,000 m high.